As someone with two young kids, I’ve really come to appreciate efficiency. Getting everyone out the door, in the car, safely to daycare, and then to work in time for a 9:00 AM meeting poses major challenges without efficiency. And it increases my disdain for those who schedule 9:00 AM meetings. If I make my lunch the evening before, that buys me five extra minutes to invest in the morning routine. If I lay out my clothes for the next day, there’s another two minutes. Change our toddler into his day clothes right after he wakes up in the morning, another minute. Back the car into the driveway the evening before so I don’t have to backout into the street the next morning, there’s 10 extra seconds! OK, maybe I’m a little crazy with this time efficiency stuff. My love for efficiency extends to NEC hoops. I’m visiting KenPom.com more times each day than I’m going to my Facebook page. (Trust me, it’s better this way.) For this latest Overtime! Blog post I’m scouring KenPom to find some players who’ve greatly improved their efficiency numbers from last year. Consider this a compilation of the unofficial All-NEC Most Improved Team. Let’s start with the most notable improver. Wow, that’s a heck of a comp for Anosike! Watch Adam Grant start off the second half right with another three pointer! Honestly, you can fall into a Twitter wormhole watching clips of Adam Grant clutch 3s (trust me, there’s plenty of them)! He’s always been a shotmaker from day one, but the addition of freshman Joe Kasperzyk and grad transfer Byron Hawkins into the backcourt has helped reduce Grant’s burden, putting him in better spots to succeed. The talent infusion has led to Grant shooting a career best 37.4% from behind the arc (41.2% in league play), while sporting a career low turnover rate (14.1%). He basically isn’t sacrificing scoring despite fewer shot attempts. Efficiency! 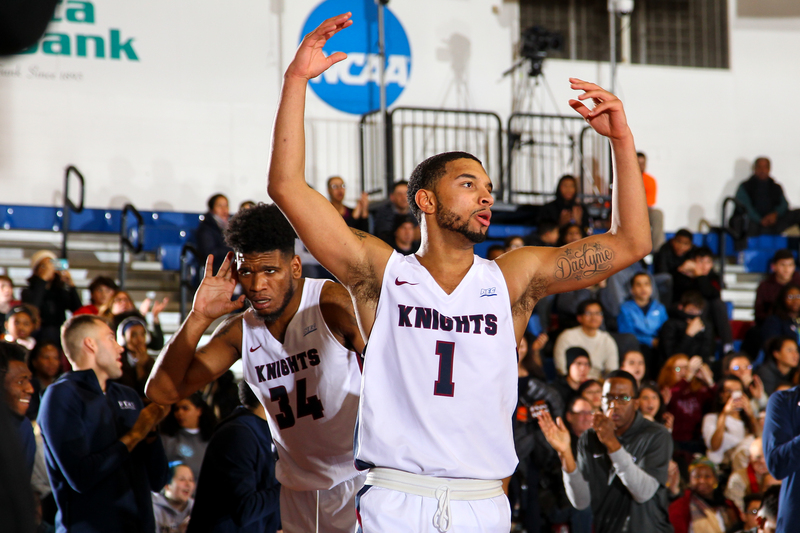 Jenkins is the lifeblood of the Knights, handling the point guard duties while playing nearly 92% of the team’s minutes this season. That’s A LOT of playing time, and yet Jenkins has managed to take a page out of the uber-efficient Glenn Sanabria book – post an assist rate north of 20%, turn the ball over infrequently with respect to a floor general and offer consistent production from behind the arc (37.8% in NEC play) and at the free throw line (88.6%, 37th nationally). 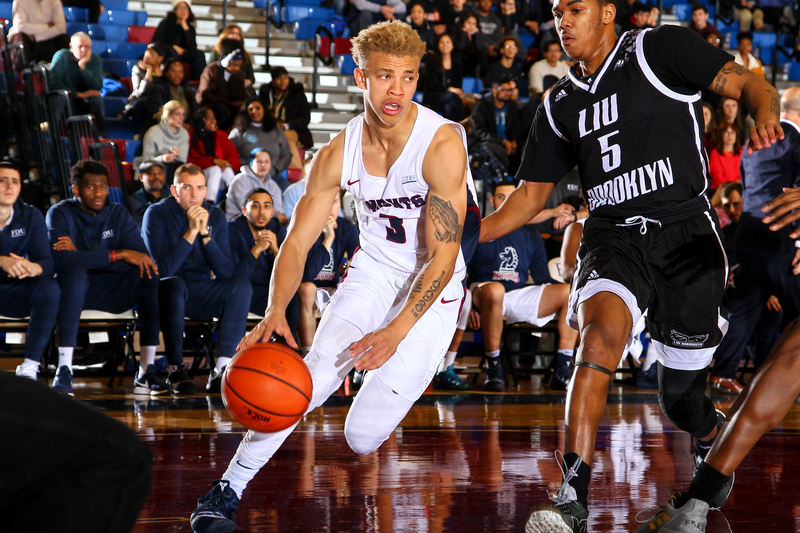 It comes as no surprise that FDU is one of the most efficient offenses in league play, with the multi-faceted Jenkins playing a vital role. The senior guard from Miami is the epitome of instant offense off the bench. With his long-range moxie as the focal point, Frias is posting the third highest efficiency rating in league play while also registering a solid 2.7% steal rate. He’s made a three-pointer in 17 of his last 18 games, a remarkable sign of consistency for someone who plays just 48% of the LIU Brooklyn’s minutes. Compared to last season, Frias has improved his scoring production by 290% (3.0 ppg to 8.7 ppg) and his rebounding numbers by 231% (1.3 rpg to 3.0 rpg), while improving his defensive profile as well. On a Blackbirds squad that prides itself on getting out in transition, Frias has emerged as the reliable scoring threat camped out behind the three-point line. 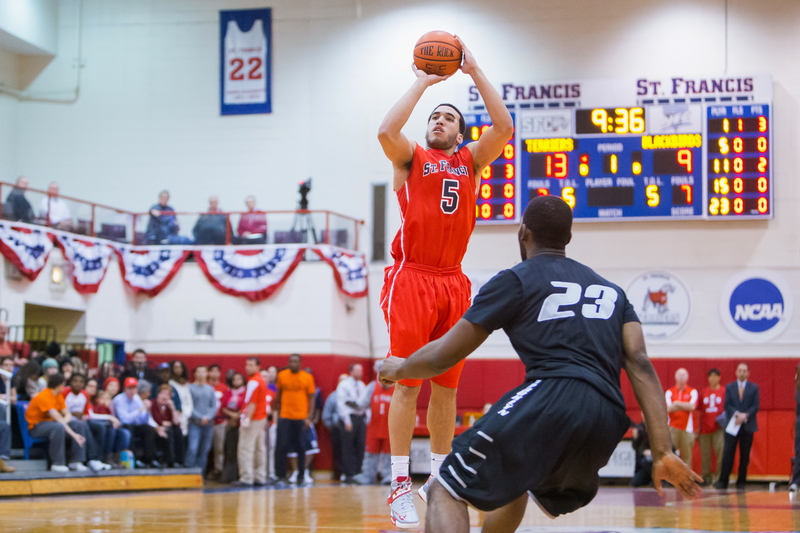 Sacred Heart’s Kinnon LaRose has the 4th highest offensive efficiency (138 ORtg) in the country, according to KenPom. He’s a role player based on usage, yet his shooting #s are 🔥. He’s shooting 67% on 2s, 43% on 3s and has committed just 12 turnovers all season. LaRose has always been an efficient player – competent three-point shooters who don’t turn the ball over usually are – but this year has been exceptional. He’s clearly the beneficiary of more talent around him, compared to last season when he and Sean Hoehn were forced to do much of the heavy lifting in the backcourt. Now with Cam Parker, Koreem Ozier and Aaron Clarke in the mix, LaRose has slotted into an off-the-bench, stretch-four role which has enhanced his strengths. There’s more space for him to make outside shots, he’s able to finish near the rim by blowing by bigger defenders and his savvy positioning has made him a sneaky good offensive rebounder (8.2% offensive rebound rate). 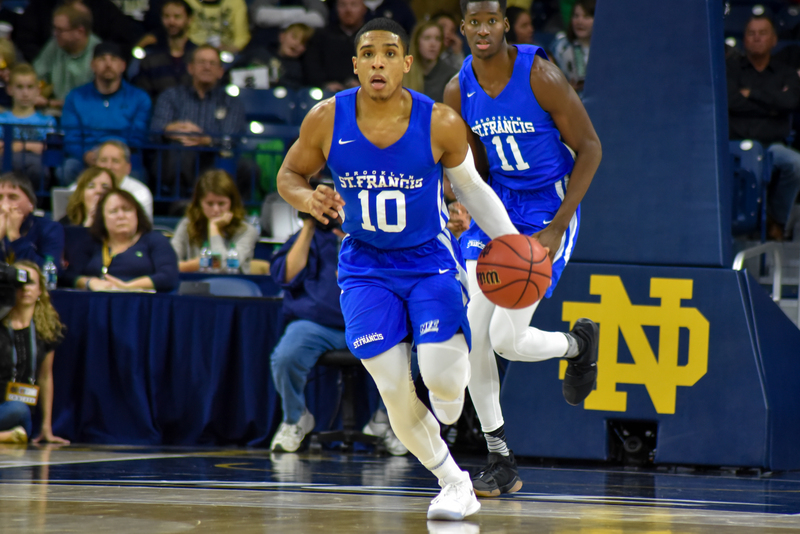 Yes, the probable NEC Rookie of the Year obviously didn’t play for the Mount last season, yet his improved efficiency has been noteworthy from an intra-season standpoint. The Mount played a difficult non-conference schedule full of bigger, physical defenses which surely impacted Morse’s play from the start. Mount coach Dan Engelstad agrees, but he also believes there are other factors at play besides the non-conference schedule. In league play, Morse has been unguardable at times, showcasing a lethal quick release on the perimeter while flying by defenders when he puts the ball on the floor. Truth be told, he’s one of the toughest players to guard one-on-one, a scary predicament down the road for opposing NEC coaches. He’s posted a KenPom offensive rating of 100 or higher in 10 of 16 league games, compared to 4 of 10 in non-conference play. Any player who’s showing his productivity by shooting 56% from 2, 37% from 3 and 76% from the free throw line in league play, should be viewed as a serious candidate for an all-conference team. Both junior college transfers have seen a steady growth the second year in Donyell Marshall’s system, although for Bute, it could be argued that he would’ve been more efficient in 2017-18 had he not injured his knee halfway through league play. As awesome as Romone Saunders is, Davis may be just as critical to Bashir Mason from an offensive standpoint. In games where Davis has posted an offensive rating north of 100, Wagner is 10-3. Coalman may have a limited role in Andy Toole’s rotation, yet something is going right when you’ve made 61% of your shot attempts, some of which came from downtown. Gaskins struggled with his offense during the non-conference campaign, but has since rebounded big time to post a 64.3% effective field goal rate against conference foes. The thought weighed on Glenn Sanabria’s mind for quite some time. With a difficult decision looming, he wanted to speak with his coach, Glenn Braica, sooner rather than later. Theoretically, the point guard could’ve waited until the conclusion of the 2017-18 campaign to air his concerns, one that pitted academics and his love for Terrier hoops against each other. But he believed initiating the discussion was prudent. 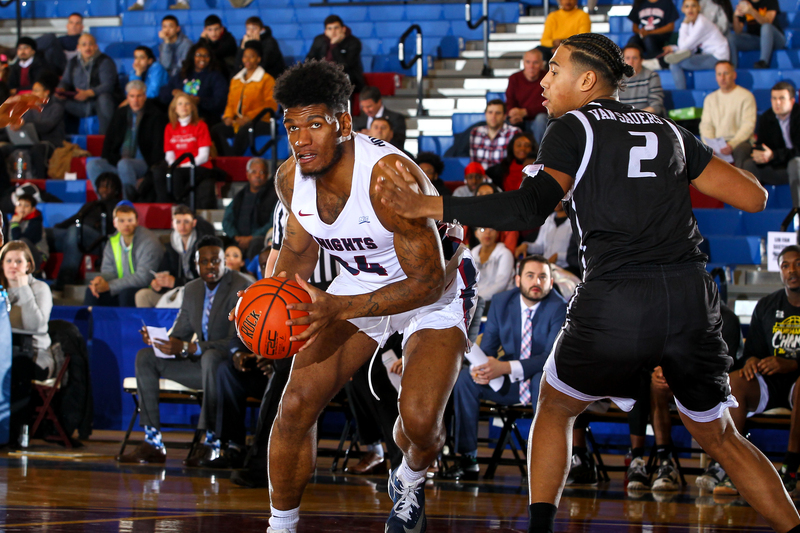 Then entering his fourth year at St. Francis Brooklyn – and third year of eligibility – Sanabria didn’t know if the college situated on Remsen Street would be a fit for him at a graduate level. St. Francis wasn’t offering the Organizational Management program that he desired, and it put him in an awkward position. Would he stay loyal to Braica, the first coach to offer him a Division I scholarship, or would he become a graduate transfer after the season? Given the Staten Island native’s reputation as a heady, tenacious floor general, the prospect of transferring to a bigger Division I program that offered a graduate degree in Organizational Management seemed inviting. While some players would’ve left Brooklyn under this scenario, Sanabria is wired differently compared to the average student-athlete. It’s loyalty that reigns supreme for him, even as the allure of competing on a bigger stage would’ve enticed another player in his position in this day and age. He chose to remain a Terrier. It worked out in the end, as St. Francis ended up adding Organizational Management to its list of graduate programs in time for the 2018 fall semester. A myriad of factors ultimately aided Sanabria’s decision to stay, but first and foremost, loyalty stood out. 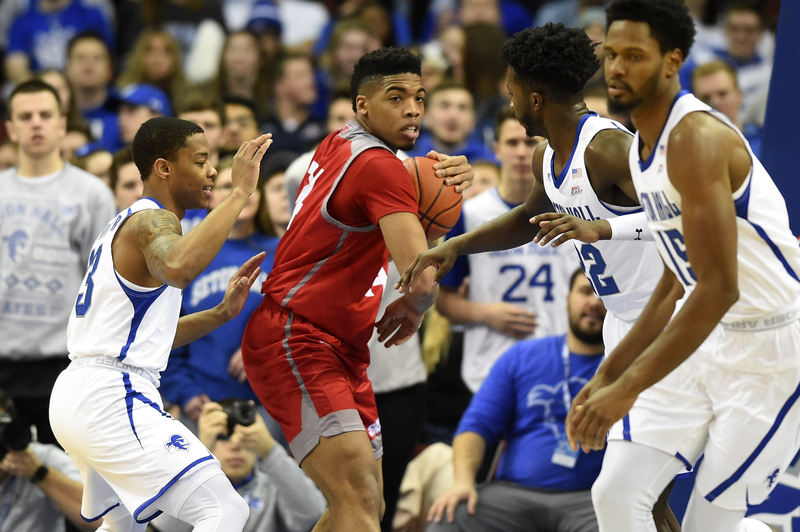 That certainly wasn’t a surprise to Sanabria’s former teammate, Jalen Cannon, who lauded Sanabria for his maturity, poise and dedication as a freshman starter, when Cannon was a senior, on a 23-win Terrier squad that won the NEC regular season championship. A few years prior, Cannon himself had an opportunity to leverage a successful two-year stint – 11.3 ppg, 8.8 rpg, 55.6% FG as an underclassman – at St. Francis into something bigger. Like Sanabria though, Cannon’s devotion to the first and only Division I coach to offer him a scholarship took precedence over anything else. 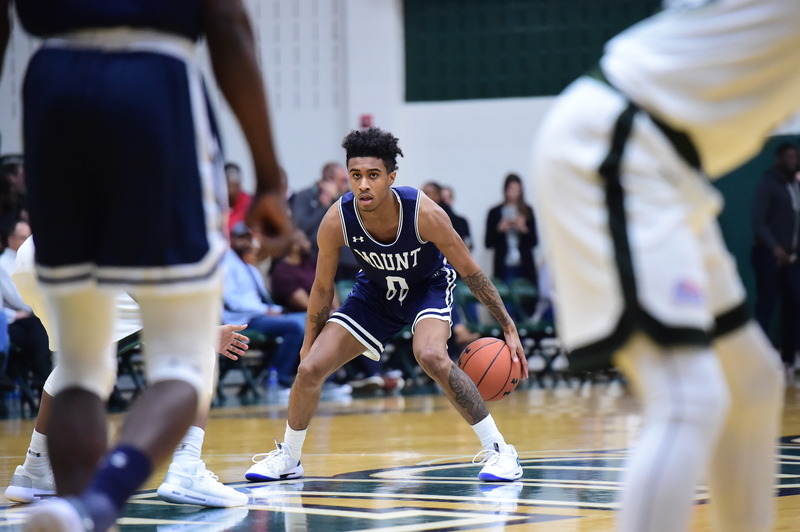 Junior Robinson, another fellow NEC Player of the Year who was a point guard adversary of Sanabria several times, is grateful he decided to stick it out at the Mount for the entirety of his college career. The multi-faceted 5-foot-5 guard certainly had the athleticism and playmaking skills to call a Power 5 program his home during the latter half of his college career. The tough-love bond Robinson shared with Christian was paramount in helping him decide that staying in Emmitsburg, Maryland was the right decision. And that’s even when the star guard saw a number of his teammates voluntarily defect, for various reasons, over the course of his Mountaineers tenure. Robinson’s devotion paid off, starting with a trip to the NCAA tournament as a junior, followed by an exceptional senior season – 22.0 ppg, 4.8 apg, 1.2 spg on an 18-win Mountaineers team. To top it off, the North Carolina native is playing professionally for Saenz Horeca Araberri in Spain and delighted fans with a scintillating 20-point performance in his NBA summer league finale last August for the Atlanta Hawks. While the personal and team accolades are noteworthy in their own right, Robinson’s decision to remain a Mountaineer helped him grow as a leader on a team that had 13 freshmen in his final season. Speaking via WhatsApp from Spain after practice, Robinson realizes now how much those leadership lessons helped him in becoming the player he is now. Had he moved onto a bigger program and became more of a role player instead of “the man”, it’s likely that leadership training wouldn’t have presented itself. The loyalty of the college basketball student-athlete is becoming more of a rarity these days. With better resources, more television exposure and more opportunities to fine tune your game and body before a professional basketball endeavor, some players are understandably taking their careers into their own hands. While those positives do exist for the past Northeast Conference stars such as Matt Mobley (St. Bonaventure), Marcquise Reed (Clemson), Cane Broome (Cincinnati) and Josh Nebo (Texas A&M), it’s the other transfers that aren’t necessarily looking to move up; instead, they opt to leave a situation that hasn’t materialized to their liking. In some cases, they’re leaving in the face of adversity. According to Verbal Commits, there were 877 transfers in Division I after the 2017-18 season. More specifically, less than half of those transfers went back to a Division I program, with the remainder either going to Division 2, NAIA, or 2-year colleges. The data illustrates that while the up-transfers have generated much of the attention at the mid-major level, it’s the players who leave after a lack of playing time as underclassmen, and subsequently transfer down, that’s become more prevalent. This player movement is all fine with Greg Herenda, even though he’s seen his fair share of transfers – up-transfers and the like – over the course of his six-year run as Fairleigh Dickinson’s head coach. He understands the mentality of a player’s decision to transfer, and the positives that decision may provide. But he’s also indebtedly thankful that his current seniors, Darnell Edge and Mike Holloway, are around as 4-year players when either could have left as underclassmen, for different reasons. Edge didn’t see much of floor as a freshman, blocked by a talented backcourt that featured Darian Anderson, Stephan Jiggetts and the aforementioned Townes. His playing time as a result wasn’t consistent and fell to a little more than 9 minutes per game over the team’s final seven games. Nevertheless, Edge trusted that if he put the work in, the playing time would eventually come. Holloway, like Cannon before him, likely had the chance to up-transfer after two successful seasons at Fairleigh Dickinson. 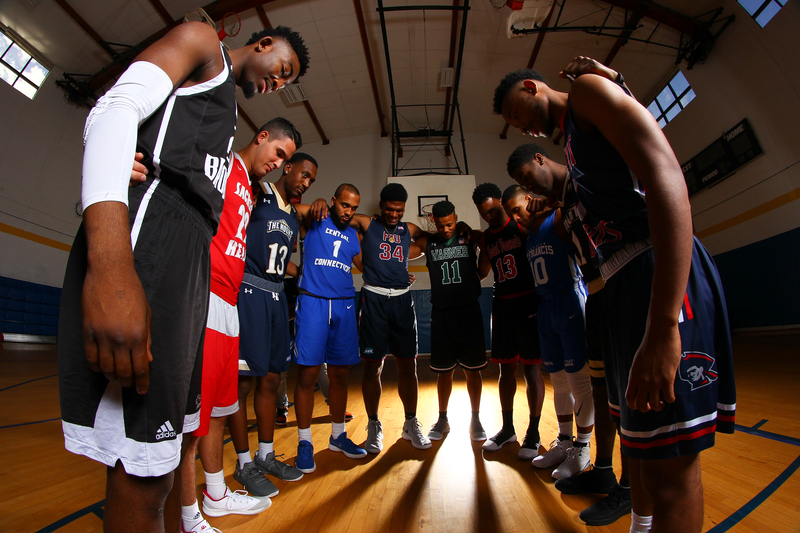 With his 6-foot-11 brother Rashaan playing in the Atlantic 10 at UMass, Holloway was certainly cognizant of the brighter lights he could be exposed to, so to speak. Rashaan was, of course, looking out for his brother’s best interest, but in the long run the younger Mike wanted to be at the place where he was most comfortable. “I still decided to stick it out because I believe I belong in a FDU Knights uniform,” he said. Comfort, paired with staunch loyalty, can be credited as a driving force much of the time when NEC players want to be a part of their respective program’s history. Holloway is very much aware of that, as is his cousin and fellow All-NEC preseason first team recipient, Keith Braxton. 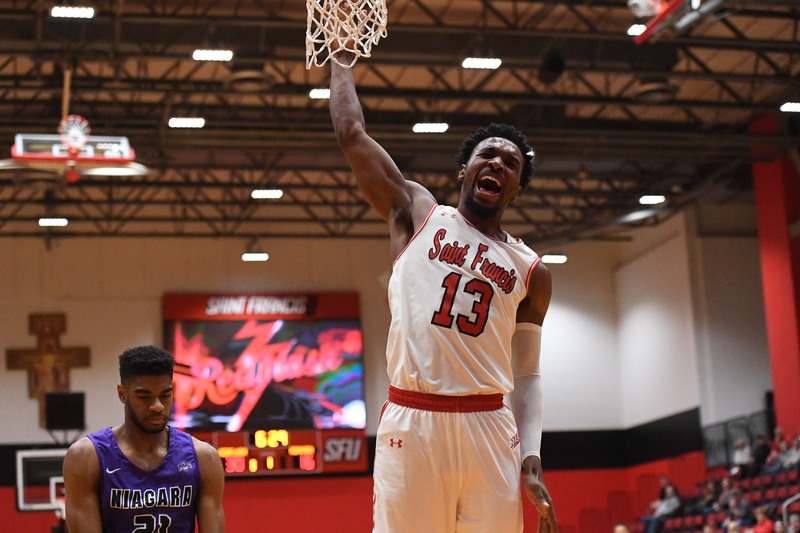 When Braxton explains his reasoning for not transferring from Saint Francis University after a stupendous start to his collegiate career, he always goes back to loyalty, comfort and community. It’s the least he could do after Rob Krimmel and the Red Flash emerged as one of the only Division I destinations for Braxton to consider after his preparatory season at The Lawrenceville School in New Jersey. Braxton is positioning himself as one of the all time greats, not just at Saint Francis, but also within the NEC. The junior currently stands with 1,323 points, 792 rebounds, 284 assists and 139 steals and has the opportunity to become the first conference player to score 2,000 points and corral 1,000 rebounds in league history. Former LIU Brooklyn great and three-time NEC champion Jamal Olasewere appreciates where someone like Braxton is coming from. He understands what it means to build your entire career at one institution. He stands as LIU’s all-time leading scorer with 1,871 points and, perhaps more importantly, was a significant part of the Blackbirds unprecedented three-year dynasty as NEC tournament champions and NCAA tournament participants from 2011-13. Even if one player – Olasewere, Kyle Johnson, Julian Boyd, Jason Brickman, CJ Garner – from that spectacular core decided to test the transfer waters, then the dynasty likely never happens and history is never made. 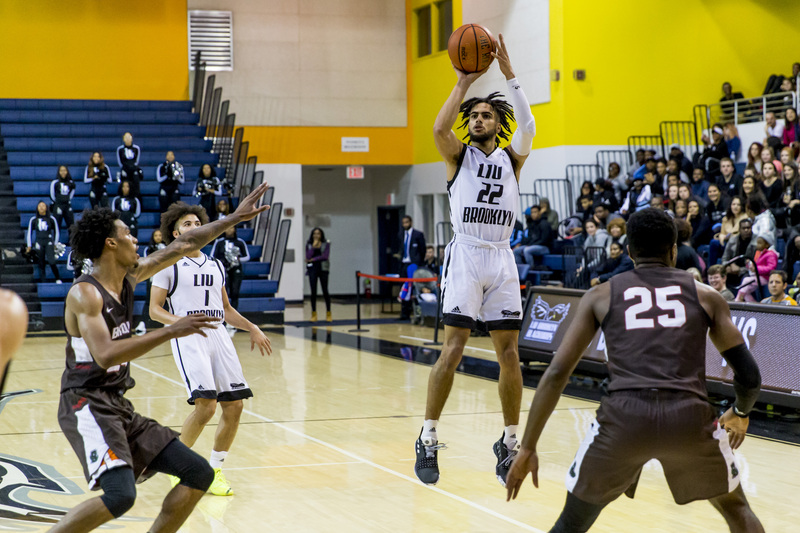 For Olasewere, he’ll never forget about being part of LIU Brooklyn and NEC lore, but building those relationships that last a lifetime takes the cake. 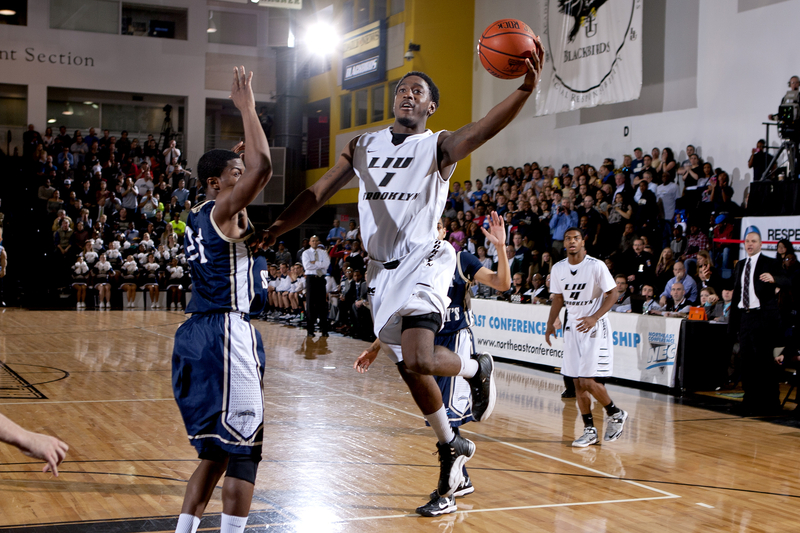 Especially when he goes back to the LIU Brooklyn campus every summer during the offseason of his professional career. The NEC is fully aware that loyalty, comfort and community serve as the main reasons for past and present players staying within the league. 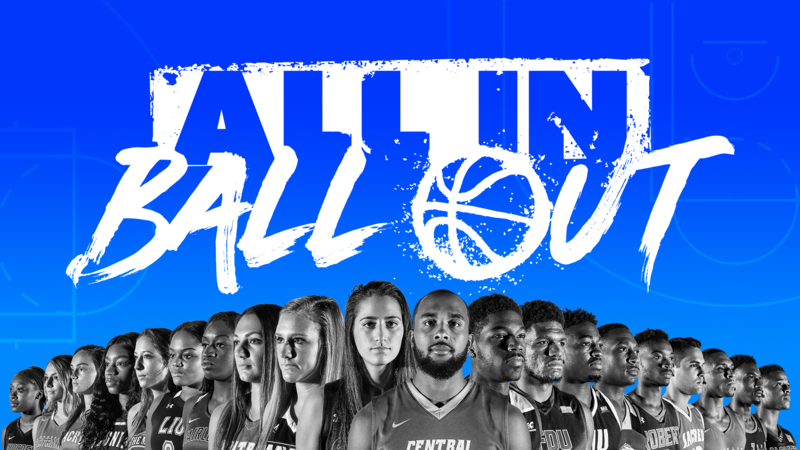 The conference’s recent All In, Ball Out campaign has focused on bringing out these core values by enhancing the overall experience for student-athletes, primarily in men’s and women’s basketball. While these initiatives were specifically rolled out at the latest NEC Social Media Day, this was actually the second part of a multi-year process the league has undertaken. In truth, this has been a priority long before transfers were a major storyline of the college basketball offseason. 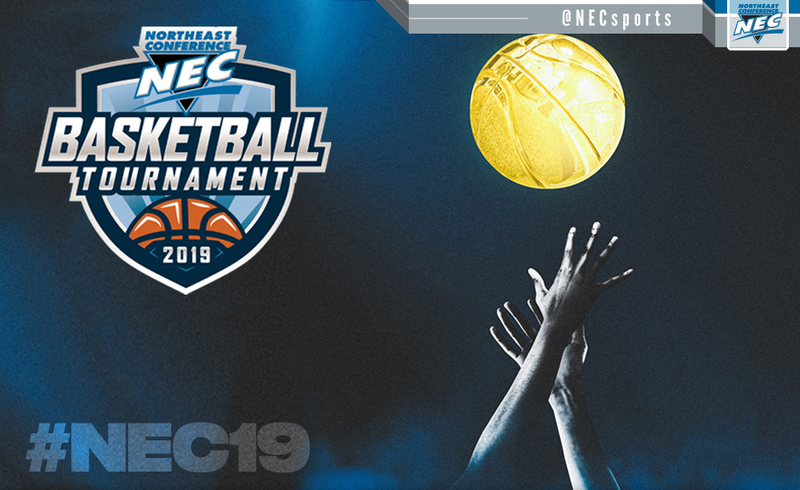 With basketball officially at the forefront of the league’s attention over the past two years, NEC Commissioner Noreen Morris and her colleagues have made a concerted effort in retaining their student athletes. “There was a plan and we attacked it from all different perspectives, but all with the intention of elevating the level of play and also elevating the atmosphere around our games so that our student-athletes are getting a better experience,” Morris said. Initiatives that revolve around optimizing non-conference scheduling, improving game promotions and activities, and requiring programs to add on-campus fueling stations for their players are just some of the examples the league’s programs have willingly implemented of late. 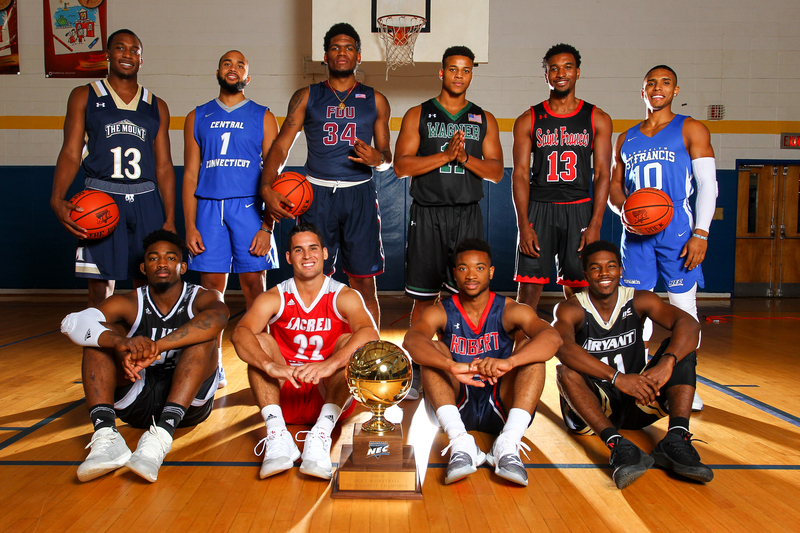 The All In, Ball In rollout comes at an ideal time, with eight of the league’s top 11 scorers in their third, fourth or fifth season at their respective school. This is a departure from recent seasons, when the leaderboard would be littered with upstart underclassmen or former transfers. This year, those top scorers populating the list such as Raiquan Clark, Romone Saunders, Sean Hoehn, Edge, Braxton, Adam Grant, SaBastian Townes and Jamaal King illustrate what hard work and perseverance will bring the NEC student-athlete if they’re fully committed to their basketball program. A few of them were even part of the All In, Ball Out media campaign that began this preseason. While it’s difficult to determine how much this campaign has helped in retaining talent, Morris is optimistic that the opportunities presented for upperclassmen will work to the league’s benefit. “I think we’ve built up a nice community of student-athletes and they feel like a part of something, so we’re trying to build on that,” she said. Clark was a former walk-on who easily could’ve jumped ship until Jack Perri offered him a scholarship as a sophomore. Saunders has seen several teammates over his five-year tenure transfer, yet he decided to stay with Bashir Mason and Wagner even though his bruising, 6-foot-3 body would’ve been an asset in a bigger program’s backcourt. Through a work ethic that’s second to none, Hoehn has progressed from a role player to an efficient volume scorer. Edge and King could’ve determined their programs weren’t a fit after one season of light playing time and opted for a change of scenery as sophomores. Grant and Townes could’ve used the recent coaching change at Bryant as an excuse to explore what else was out there on the Division I landscape. For each of them, loyalty, comfort and community likely played a role in their decision. And while student-athletes are putting their own collegiate careers into their own hands, and sometimes rightfully so, it’s refreshing to know that these core values aren’t lost on all of them. 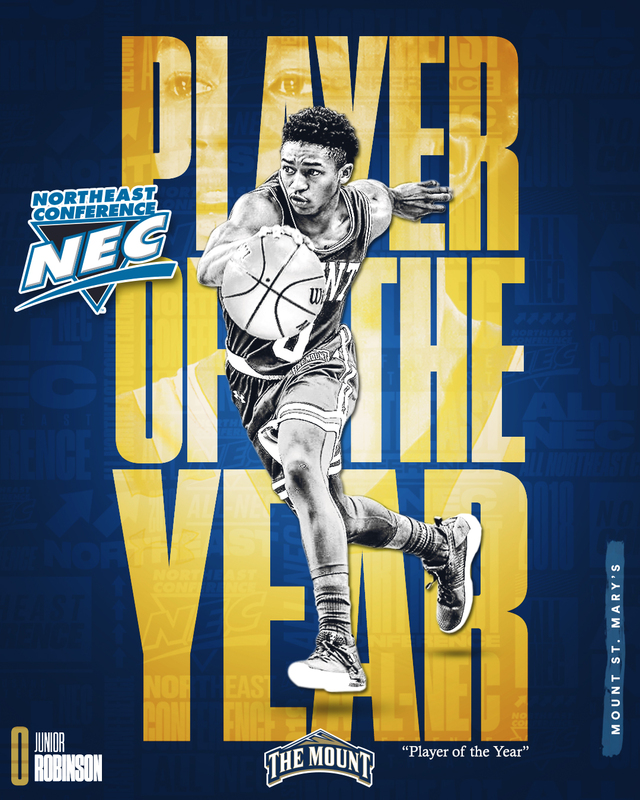 The Northeast Conference has had their fair share of recent successes of four and five-year players and will continue to do so moving forward. And the league is hopeful their efforts from a school and conference level will be fruitful from a competitive standpoint. As the former United States Secretary of State Colin Powell once said, “Success is the result of perfection, hard work, learning from failure, loyalty and persistence.” The NEC has plenty of college basketball student-athletes who are living by this mantra everyday.